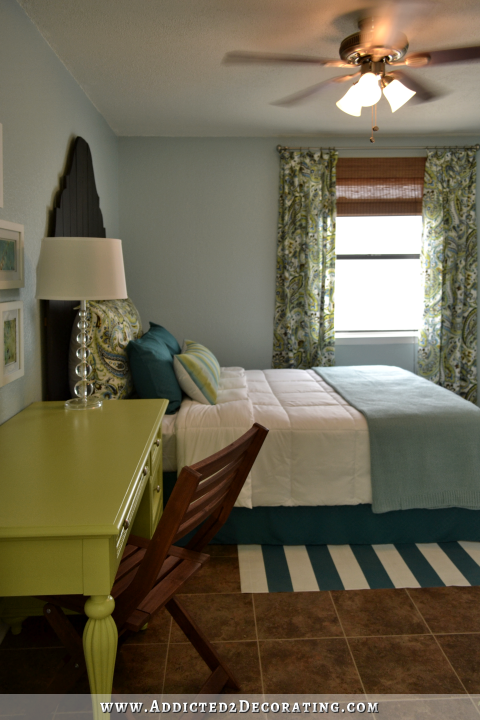 One of the things I worked on during my blogging break was the second bedroom at the condo. Once I got all of the necessary things done in there — painting walls, installing and painting baseboards and quarter round, finishing the grout on the floor, switching out the old almond-colored outlets and switches with new white outlets and switches, etc. — I went ahead and did a little decorating and staging. It’s nothing fancy or over-the-top. In fact, it’s pretty minimal, and I tried to do it as inexpensively and quickly as possible. I think it goes without saying that if we were still living in this condo, this room would look vastly different, and I would have put much more time and money into it. But I really like how this quick makeover turned out! And I love that it goes to show that a room can look put together and presentable with just a little bit of time and effort, and a minimal amount of money. 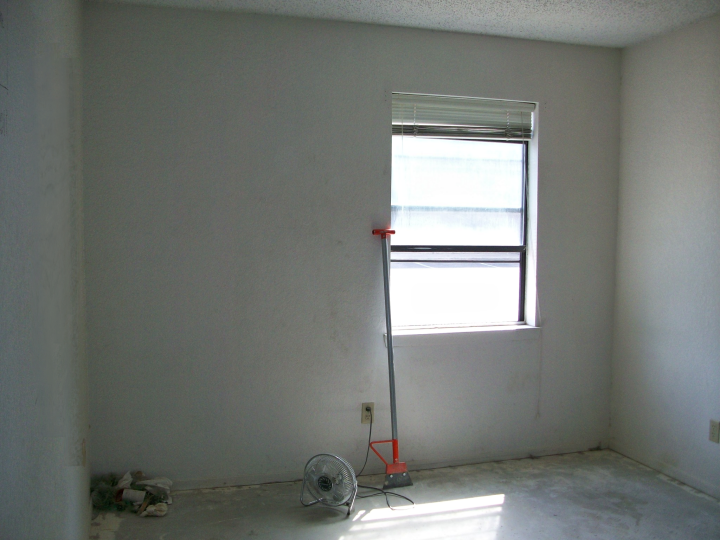 I looked for some before pictures of this room, and I found some but they’re not very good at all. 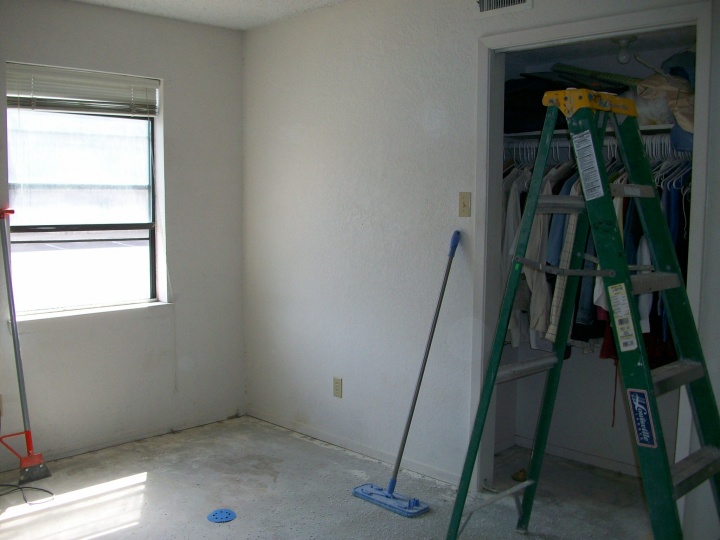 I mean, the room was just an empty, dingy white box with even dingier off white carpet. 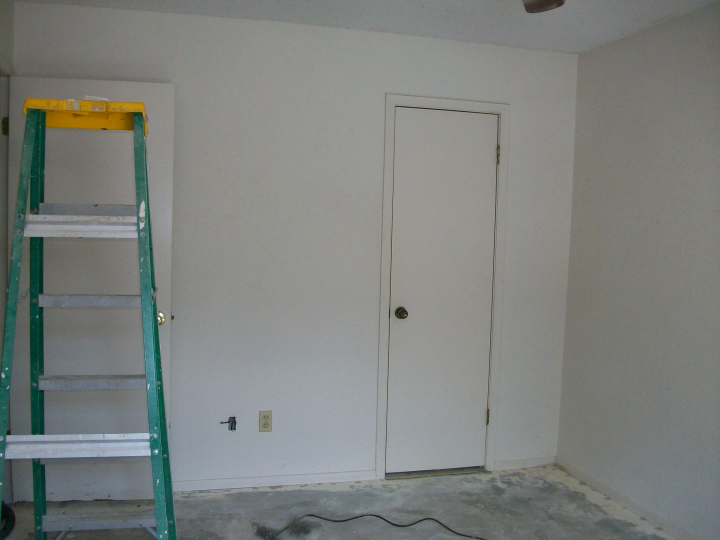 I found some pictures that I took after I had removed the carpet, which was one of the first projects I did after we moved into the condo over eight years ago. 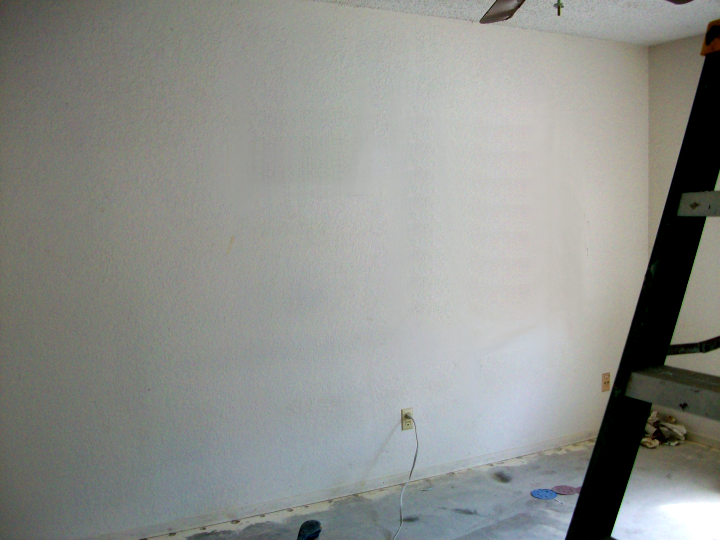 Here’s the wall where the desk and bed are now. The wall to the right of the window wall is where the closet is. The door to the hallway is just right of the closet. And here’s the wall with the doorway to the bathroom. This is officially the master bedroom since it has the attached bathroom, but we actually used the other bedroom when we lived here. Anyway, this makeover started with the paisley fabric (Braemore Somerset in Jade) that I bought several years ago. I had always intended to use it in the condo living room (in fact, you might recognize it from the valance in the breakfast room), but I had about eight yards of the fabric, which was the perfect amount for one pair of curtains and the two large pillow shams. 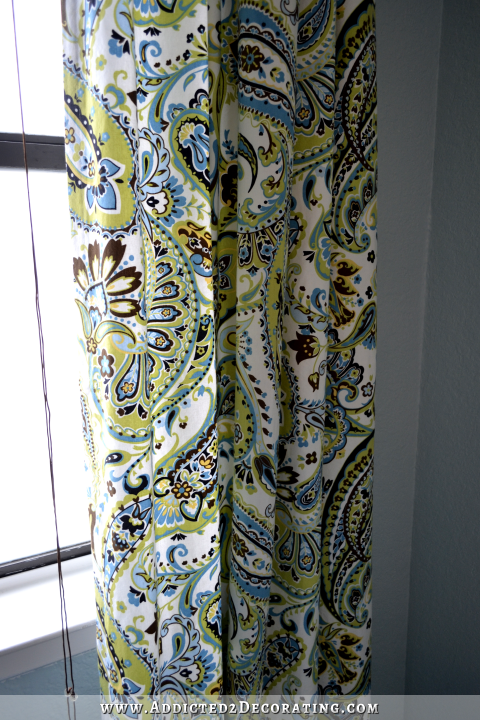 And since it’s not exactly a fabric that I’d ever use in the house, I decided to use it all up in the condo. 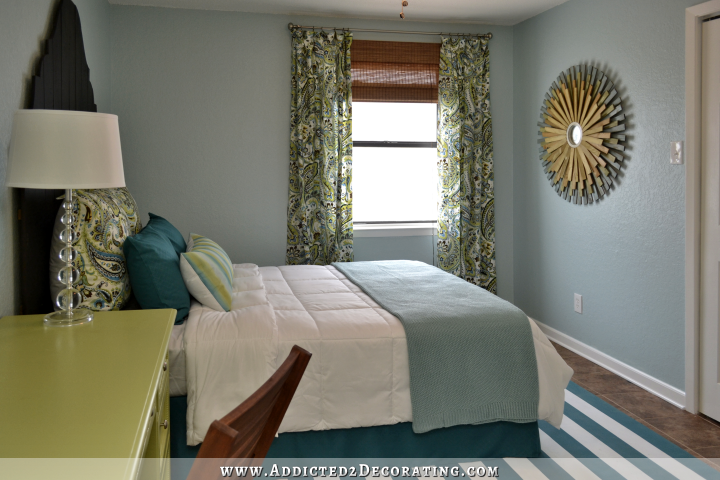 I used the lightest blue from the fabric for the walls. It’s called Rain Washed from Behr, and it’s such a light and fresh blue. It has some gray in it so that it’s doesn’t feel like a baby blue that belongs in a little boy’s room. The Roman shade on the window is my favorite Designview Providence bamboo Roman shade from Home Depot. The big sunburst mirror is one that I made two years ago from large wood shims. It always looks so much smaller in pictures than it really is, but it’s about 40 inches in diameter. It didn’t have a home, and I had a big empty wall, so I decided to use it in this room. 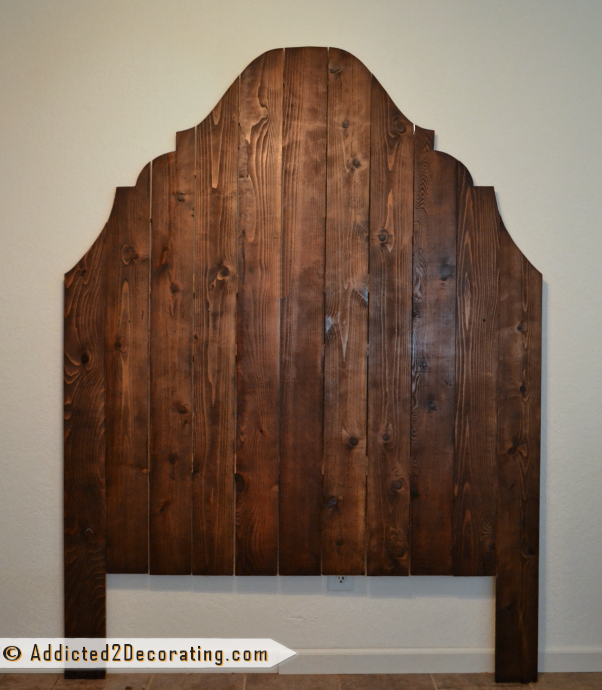 The headboard was another project that I did about two years ago. It’s made from fence pickets, so it cost about $25. It was actually much lighter in color, with lots of wood grain showing. So before I attached it to the wall and made the bed, I gave it a quick wash with some watered down black paint (brush on, let it soak in like stain for about 30 seconds, and wipe off any excess with a rag) to tone down the color and hide some of the busy wood grain. I had the hardest time finding a bedskirt that would look right in this room, so when I came across a set of teal sheets at Ross for $17.99, I snatched it up. I cut up the sheets into wide strips, and attached them to the box spring (using the factory-finished edge along the bottom at the floor) with fabric tape to create a no-sew bedskirt. And then I used the two pillow cases that came with the sheet set to give some color to the bed. The pillow in front is one that I made using some scrap drapery lining and leftover paint. 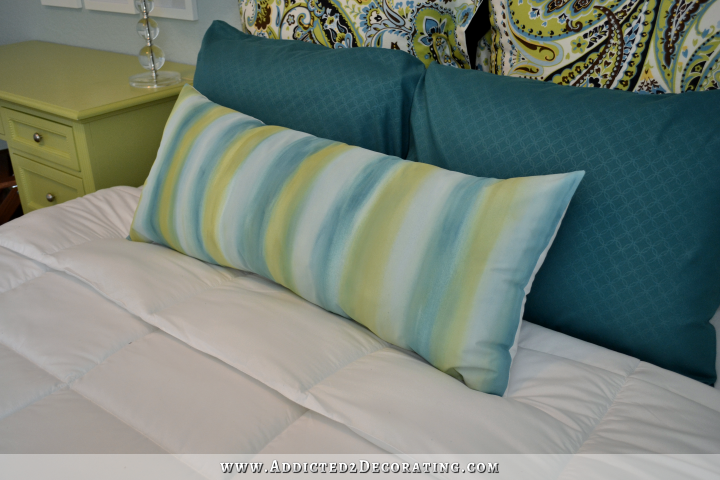 I used three paint colors (the light blue is Rain Washed, the green is Grass Cloth, and the teal is Mosaic Tile, all from Behr) and a very watered down brush to create kind of a free form watercolor striped effect on the scrap piece of drapery lining. I painted the fabric, let it dry completely (took about two hours), and then sewed the pillow together. The desk is one that I’ve had for about four years. 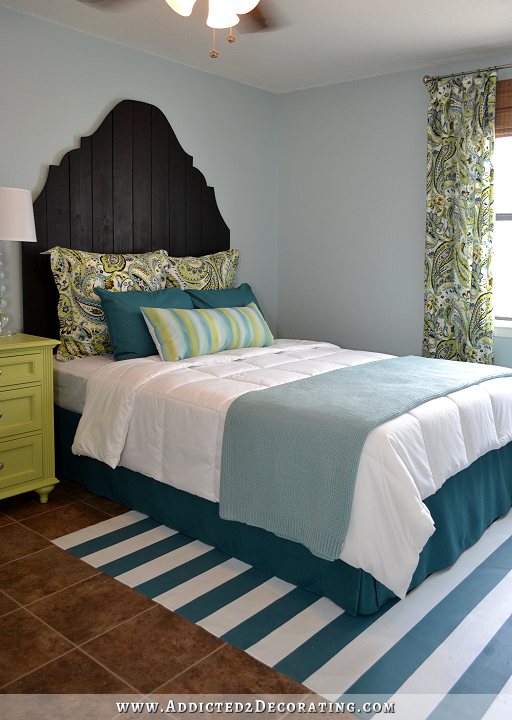 It didn’t make the cut for the house, so this bedroom was the perfect place for it. I gave it a new coat of paint in Behr Grass Cloth. The lamp is one I’ve had since 2008. I bought a pair for the Symphony Showhouse room I showed you yesterday — the little girl’s room — and I’ve had them stash away ever since. The original lampshades were long gone, so I picked up a new one for about $10 from WalMart. The pictures above the desk are a series of artistic photos that I bought years ago. They’re a carnival theme, and unfortunately I can’t remember the photographer’s name. I did have to purchase eight frames for them, and frames can be pretty expensive, but I happened to find some for half price at Michael’s. 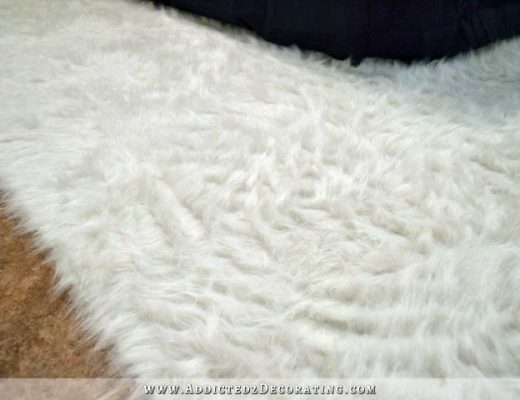 I wanted a rug in here, but couldn’t find one that looked even halfway decent in this room for less than $200. So I picked up a 6′ x 8′ piece of remnant vinyl flooring from Home Depot for $25, and used painters tape and leftover latex paint (in Polar Bear and Mosaic Tile) to make a striped floor cloth. It was quick and easy, and makes a huge impact in the room. I didn’t topcoat the painted stripes, but if I were keeping it and using it regularly, I would have used a non-yellowing clear coat on top (probably a water-based polyurethane). And finally, the chair at the desk was about $25 from Marshall’s, the blue blanket on the bed was $49.99 from Target, and the comforter was $25 from Walmart. Overall, I spent about $250 out-of-pocket over the last couple of weeks to decorate this room. Of course, that’s not including the original cost of items that I already had on hand and that I used in the room (sunburst mirror, headboard, paisley fabric, lamp, art photos, etc.) And the two largest items (mattresses and desk) were actually given to me, so they cost me nothing. But I think most of us have furniture and decorative items stashed away in the garage or attic that we’re not using, and that we can pull out to decorate a room that needs some attention. So I think that making a room look pulled together for around $250 to $500 is really quite doable for most of us as long as we’re willing to shop the house and use a lot of what we have. Things might need to be freshened up with a new coat of paint, but that’s an easy DIY project! I think it looks beautiful! I love the curtains! Your quick, inexpensive fix looks GREAT! 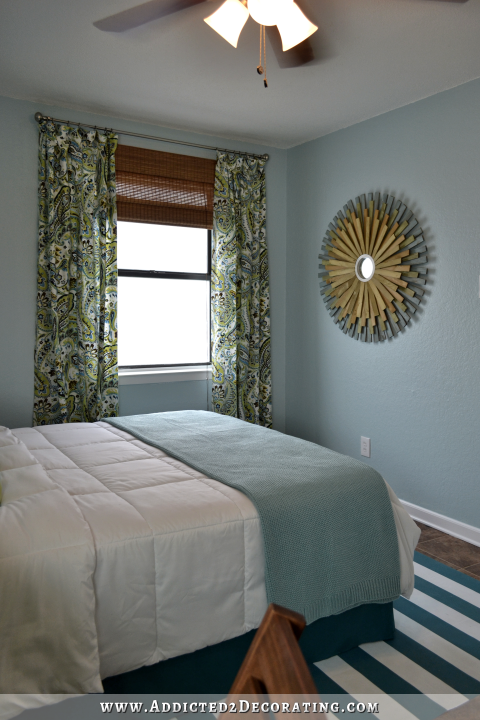 You’ve put so much energy in to staging this condo….will you try and sell it furnished? I love what you have done to the whole place! You sure can not tell it’s “inexpensive” – it looks fabulous. It looks wonderful Kristi! You are amazing! Do you ever decorate anything that isn’t drop-dead gorgeous??? I mean, your spaces are just so beautiful! I am so glad to see you are back. I think it looks great. I love the headboard…it looks high and prominent in the room. Welcome back! I’m glad you took a break…but I missed you! Typically I don’t lean towards a blue color palette but there’s just something about this that calls my name. Can’t wait to see what you do in the living room! I’m willing to bet the first buyer through the door is going to be just that … a buyer! Can’t imagine how they could resist! A fresh take on classic. I love it!! She did in a post a while back. Click on one of her subjects at top of her page, like maybe tutorial? I think it looks great and was also wondering if you will sell it furnished. I believe she said a while back that she was selling it furnished. The room looks great! I love the design you have done in your other bedroom too. What other rooms do you have to do? Love following you. You are so inspiring. Oh,I love it!……..your talent of knowing how to put it all together is amazing! Just soooo cozy and inviting. 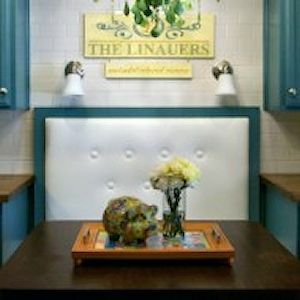 Will you offer the buyer the ability to purchase the furniture, etc? Beautifully done…..and so glad that you took some time off…..you needed it….and so glad for you. The condo is turning out beautifully…….so thrilled for you. Great job. You said yesterday you weren’t going back to Condo , so is it ready to go on the market? If they don’t want the furniture etc what will you do with it. A yard sale would bring you decorating money. As usual Kristi, everything looks amazing! I can’t wait until you share feedback from perspective buyers! Wow! The room looks great, and at the same time you are essentially de-cluttering since you are using up things that you would be having in storage for ever! So in a sense, you are also working on your own home! Love it! Are you done with the condo now? Is it on the market? Kristi, you have done it again!!! You never cease to amaze me! My favorite color is teal or any shade of blue, and you use it beautifully! Thank you so much for the joy you bring with every post! You’ve hit it out of the park again! Great job…. Great job! I love the colours! Apparently you are going to offer the sale of furnishings etc. since you’ve taken so much time, effort and expense with the staging. I don’t remember if you said in an earlier post, so sorry if I missed it. It’s very nice but maybe a bit overdone if you just plan to sell the shell of the condo. Also, are you going to hire a realtor to list and show it, or are you going to sell it on your own? 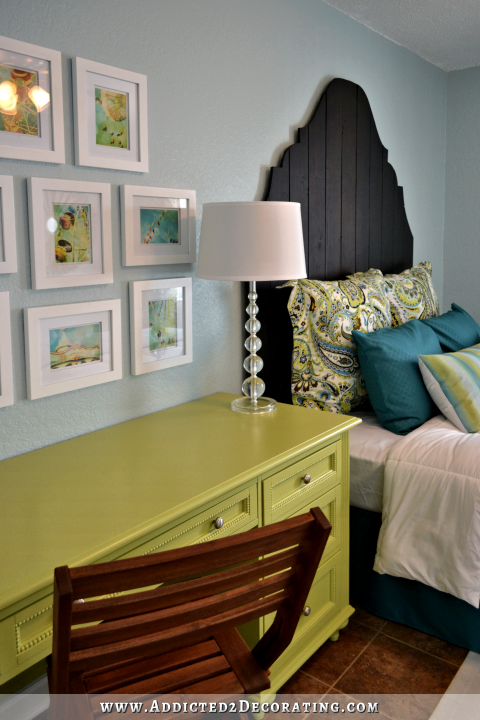 Love the colors in the room…..Especially love the headboard. Love the room! So serene, but still colorful! Talk about thinking outside the box……. You know no limits to your creativity and repurposing ANYTHING ! Love your blog…..thrilled to see you back at it! Never boring, always creative and inspiring. You are amazing. Kristi, Anyone with a large budget can decorate but you did a fabulous job on a very small budget. Well done. This has always been my way of decorating except when in my Interior Design college courses, I had a much larger budget! Really love how it all came together and how you went shopping at home first. Wonderful! . . . and inspiring! I love it. That headboard is expecially genius. It is beautiful! I’m glad you are feeling better and were able to get so much done over the last couple of weeks. I have missed looking at your projects. The desk needs to come home with me! I love it! So glad to see you are back and hopping! I LOVE the fabric you used for your curtains. It is fresh. It pops!! match perfectly and bring an airier feeling to the bathroom? You get more done while “resting” than the rest of the world does in hype speed! That said, I’m curious. What are you planning to do with the home decor items and all the fabrics and things you made when it sells? Are you planning to sell it completely furnished and let all of that go? Store all that stuff “just in case” you need it on a future project even though you know you won’t use it in your new home? If not, maybe you should have an upscale “decorator’s closeout” yard sale and sell the items to people who have less design imagination than you (you know, most of us) and then add the cash to your decorating budget for the new house. What one does to sell a property and what one does to sell a property when you make your living photographing, describing, and publishing your home projects are two vastly different things. Such a beautiful job, Kristi! You are so amazing in all that you accomplish!!! 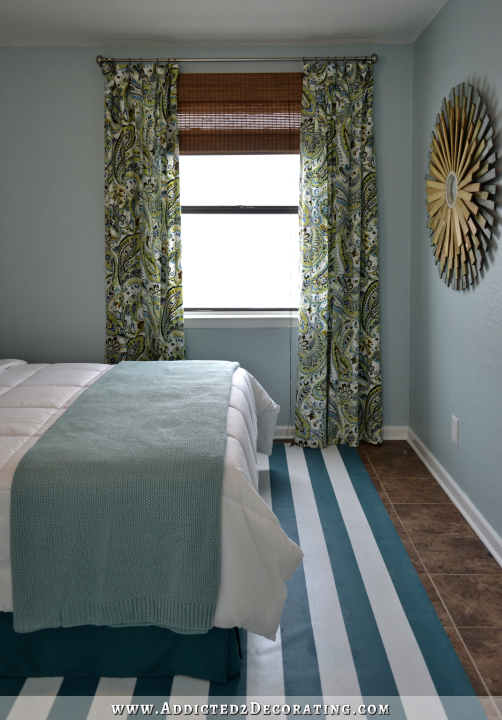 Is there some rule of thumb you use when choosing the colors & patterns of all the items you place in the room such as bedding, pillows, rug, curtains, wall, desk? I like to “do it myself” but am not able to achieve the beautiful end results you achieve after painting furniture, picking curtain fabric, bedding, etc. Are there clear rules you follow or do some people just have special design abilities that others lack? Something that has always puzzled (frustrated) me! 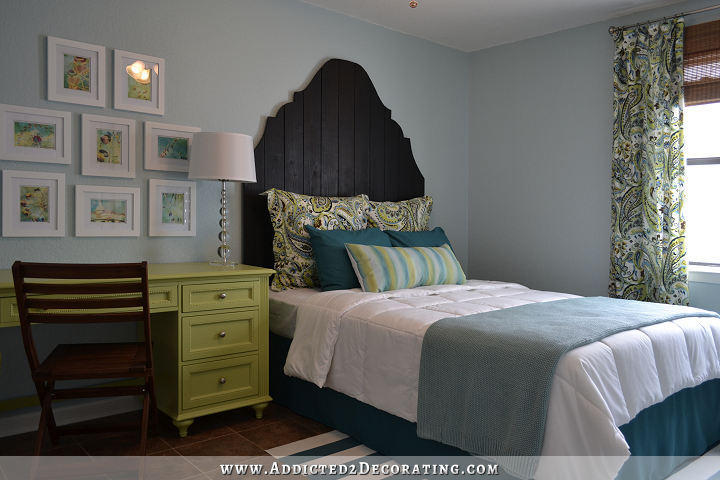 Love your bedroom, and want to copy the headboard for our master!! Wow Kristi, you’ve done it again. This bedroom is absolutely gorgeous. The colors are so calming, classic and yet stunning and modern at the same time. The way you have this bedroom staged, looks very high end and I particularly love all the framed prints above the desk area, this really makes the room pop! The future buyer is going to be one happy person! LOL! Once again I am in awe. I have never been into blues for decorating but you’ve made a believer out of me, lol. I was shopping yesterday and everything I gravitated toward was blue and green, lol. Gosh, it’s beautiful! Welcome back! 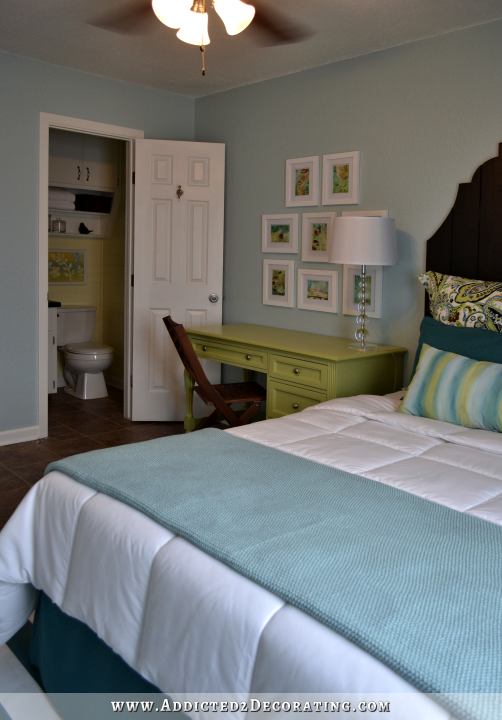 What a pretty, restful room! I love it!